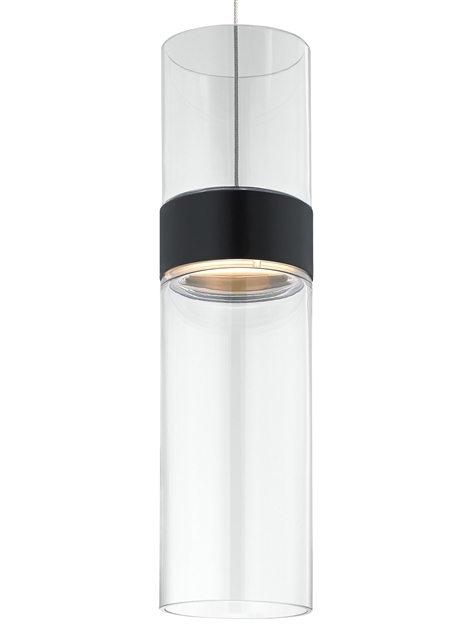 The Manette pendant light by Tech Lighting is an elevated version of the classic cylinder pendant. With its simple cylindrical design and added sleek metal bands the Manette exudes style and simplicity. This hand-blown pendant can be customized via several color combinations to match your unique preferences. Available color options include clear, smoke, white and transparent smoke. Three on trend hardware finishes are available along with your choice of energy efficient LED lamps. Due to its larger size the Manette is ideal for kitchen island task lighting, dining room lighting and home office lighting applications. Complementary Manette Grande and flush mount also available by Tech Lighting, simply search for Manette Grande to find its closest relatives. Includes 6 watt, 330 delivered lumens (260 lumens down/70 lumens up), 3000K, LED. Dimmable with low-voltage electrionic or magnetic dimmer (based on transformer). Ships with 16 feet of field cuttable suspension cable.